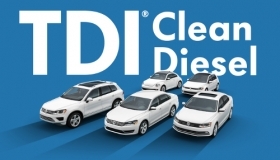 Volkswagen promotes its clean diesel technology on its Website. "We expected better from VW." WASHINGTON -- In the end, federal environmental regulators gave Volkswagen an ultimatum: Offer a convincing explanation for why many of its diesel vehicles were spewing more toxic emissions than they did in the test lab or face the loss of EPA certification for all its 2016 diesel models. At that point, on Sept. 3, Volkswagen chose to explain. And the explanation turned out to be a huge embarrassment for a company whose U.S. identity is closely tied to the promise of peppy "clean diesels": Volkswagen, the EPA said, used special software to manipulate its emissions controls during U.S. emissions tests, effectively doctoring its emissions results on seven model years' worth of diesel vehicles going back to 2009, in violation of the Clean Air Act. Last week, the EPA announced that 482,000 Volkswagen and Audi diesel vehicles were fitted with what the agency called a "defeat device" -- software that would detect when a car is undergoing EPA emissions testing and turn on the vehicle's full emissions controls. The software then switched off the full emissions controls during real-world driving, the EPA said. With the controls off, the cars emitted nitrous oxide at levels 10 to 40 times greater than what was permitted by law, according to the EPA. Compared with other run-ins between the EPA and automakers, VW's alleged violation stands out in its brazenness. Ford and Hyundai-Kia both had to reduce the fuel economy ratings on several vehicles in recent years under EPA pressure, but those revisions were tied, in Hyundai-Kia's case, to errors in calibrating mpg tests, and in Ford's to exploiting loopholes in the law. Volkswagen, on the other hand, admitted to installing software code designed to manipulate the results of EPA tests, regulators say. "These violations are very serious, not only because illegal defeat devices result in excess emissions many times the allowable standard, but also because VW was concealing the facts from EPA, the State of California and consumers," Cynthia Giles, assistant administrator for the EPA's Office of Enforcement and Compliance Assurance, said in a conference call. "We expected better from VW." Janet McCabe, acting assistant administrator for the EPA's Office of Air and Radiation, said the office will "hold VW responsible" for recalling the affected vehicles to reduce the excess emissions but said no recall order was issued as part of the announcement Friday, Sept. 18. In a statement, VW said it would develop a remedy with the EPA and the California Air Resources Board. For now, no fines have been ordered, as the investigation is continuing, but the EPA decided to announce the alleged violations to inform the public and "to put VW on notice of our continuing investigation," Giles said. The investigation is being conducted in cooperation with CARB. Under federal law, the EPA can levy a maximum fine of $37,500 per vehicle, EPA officials said on the conference call Friday, meaning VW and Audi face potential fines that could top $18 billion. Volkswagen said it's cooperating with the investigation. "This is a notice of non-compliance that needs to be addressed," the statement said. For more than a year, federal and California regulators had been investigating independent test results indicating older VW diesel vehicles were far dirtier in the real world than official emissions test results indicated. The independent analysis came from researchers at West Virginia University, working with the International Council on Clean Transportation, a nongovernmental organization. VW initially responded that the disparities were caused by "various technical issues and unexpected in-use conditions," the EPA said. But as the regulators pressed their inquiry, the EPA said, "none of the potential technical issues suggested by VW explained" the disparities. According to the EPA, the agency and CARB this month demanded an explanation from VW and were prepared to withhold certification that VW's 2016 diesel vehicles complied with U.S. emissions standards. The EPA has since withheld those certifications, which effectively blocks their sale. VW has now ordered U.S. dealers not to sell any remaining 2015 models with 2.0-liter diesel engines. And the automaker ordered an internal investigation. Also today, CEO Martin Winterkorn issued a statement apologizing for the violation. "I personally am deeply sorry that we have broken the trust of our customers and the public," Winterkorn said in the statement. "Volkswagen has ordered an external investigation of this matter. We will do everything necessary in order to reverse the damage this has caused." The withholding of the certification could be a devastating blow for VW, which relies on diesels for roughly a fifth of its U.S. sales and has made its clean diesel technology a cornerstone of its brand identity, setting it apart from mainstream competitors. "Only then (when confronted by regulators) did VW admit it had designed and installed a defeat device in these vehicles in the form of a sophisticated software algorithm that detected when a vehicle was undergoing emissions testing," the EPA said in its notice on Friday. "The dogged detective work in the lab provided the data and resulted in an admission that VW did indeed have a defeat device in its software for diesel cars," Richard Corey, executive officer of CARB, said on the conference call.